Kickapoo High School 2016 Project Team of the Year | DeWitt & Associates, Inc.
Kickapoo High School Performing Arts Center and FEMA Safe Room was recognized by the Springfield Contractor’s Association as the 2016 Project Team of the Year. 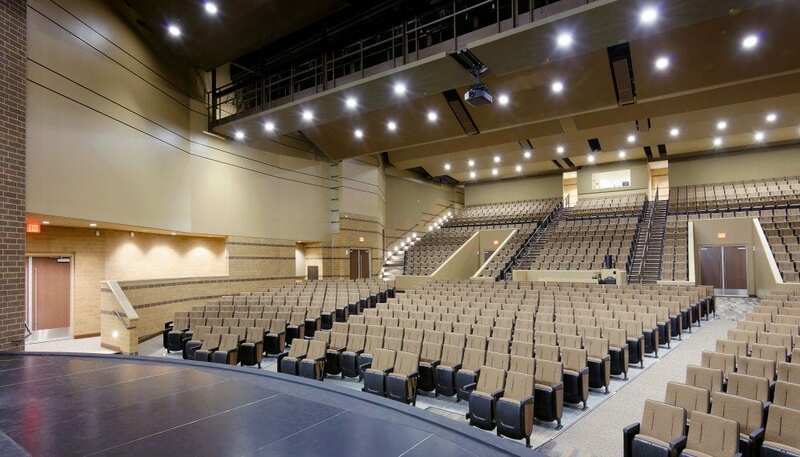 The auditorium doubles as a Federal Emergency Management Agency safe room and includes a professional-grade performing arts center that will provide students hands-on experience with theatrical productions. The Performing Arts Center is equipped with state of the art technical theater systems that include sound attenuation characteristics to enhance the quality of the performances. Also includes an orchestra pit and a complete fly loft with staging curtain drop system. The addition is flanked by support facilities for the performing arts program including dressing rooms, make up areas and a newly enhanced south entry into the main facility containing a statue of an American Indian representing the Kickapoo Chiefs. This project was completed on time and on budget.